It’s hard to believe, but we are now half-way through summer. If you aren’t already deeply-immersed in the weekend picnic and backyard BBQ scene, it’s time to step up your game! 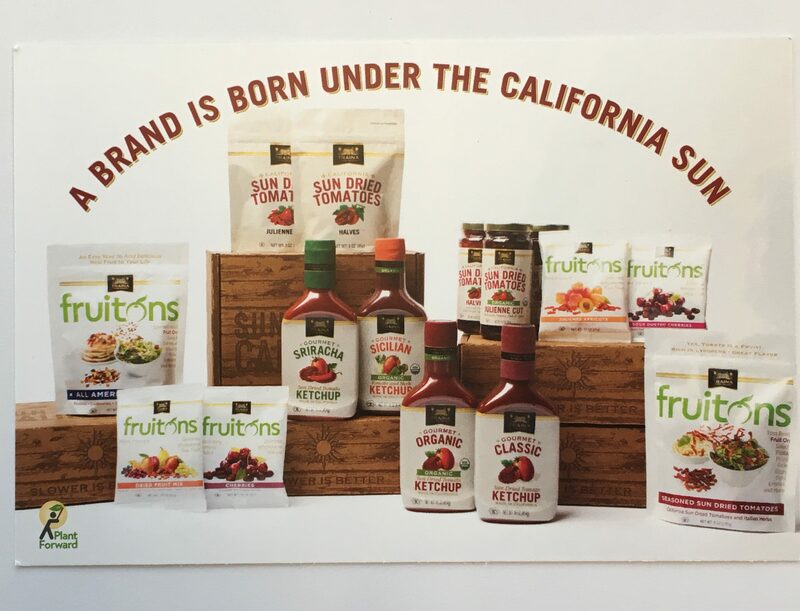 Traina Foods has just introduced Home Grown; a new line of healthy dried fruit snacks and gourmet condiments that makes it easy to bring the taste of summer to your table right now! One of the best things about summer is the abundance of fresh summer fruits that you can find everywhere — from the grocery store to your local farmer’s market. But, as silly as this may sound to some, there are those who miss out on fresh summer fruits because the time and effort it takes to wash, peel and cut up the fruit is just too daunting. 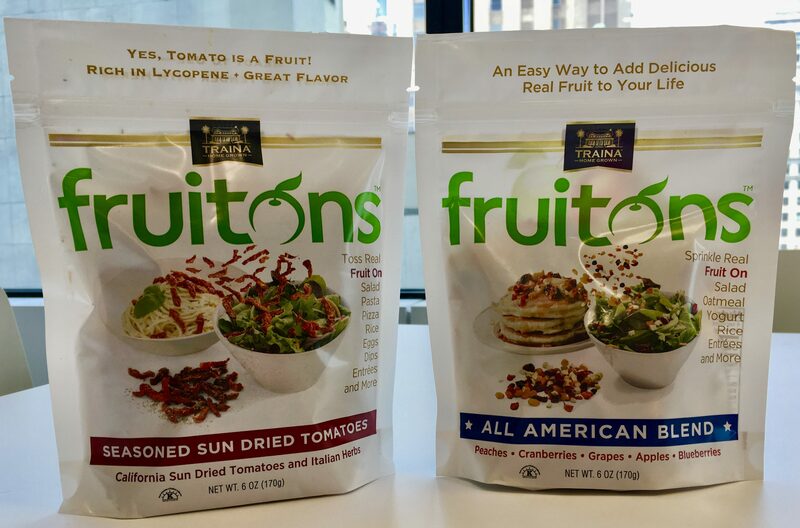 With a plant-forward approach to eating in mind, Traina Home Grown introduces Fruitons, a delicious, convenient way to help you meet your overall healthy diet needs with perfectly portioned snack bags of their naturally sweet California sun-dried fruit. Sun-dried fruit is nutritionally equivalent to fresh fruit, being high in fiber, healthy nutrients, and antioxidants. Good to know! 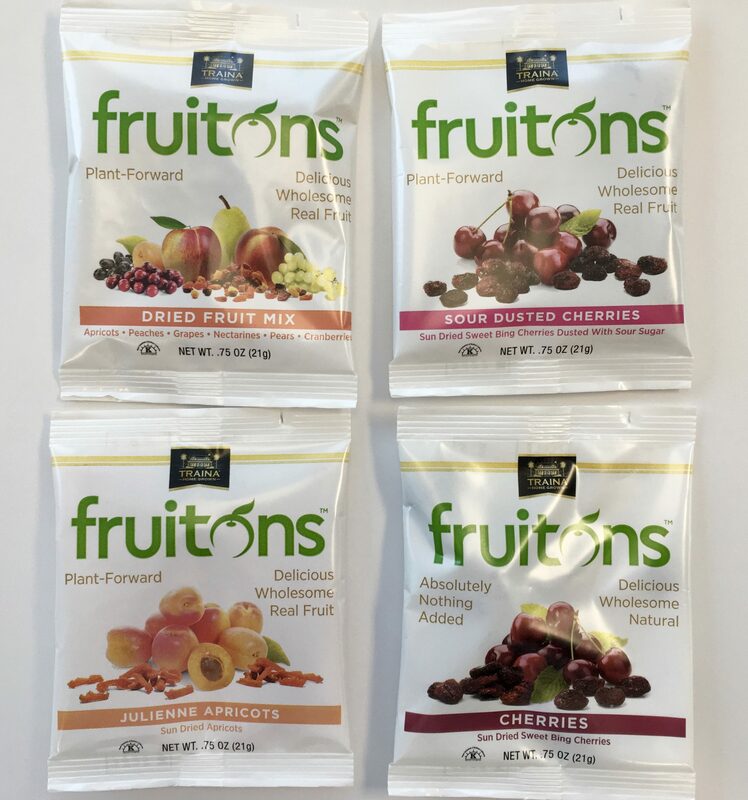 Not only are Fruitons a tasty, grab-and-go snack, but they can also be a versatile ingredient in creative meal preparation. I’ve been taking Fruitons to the office and adding them to the morning oatmeal I buy in the cafeteria. Oatmeal With Apricot and Cherry Fruitons Mixed In! 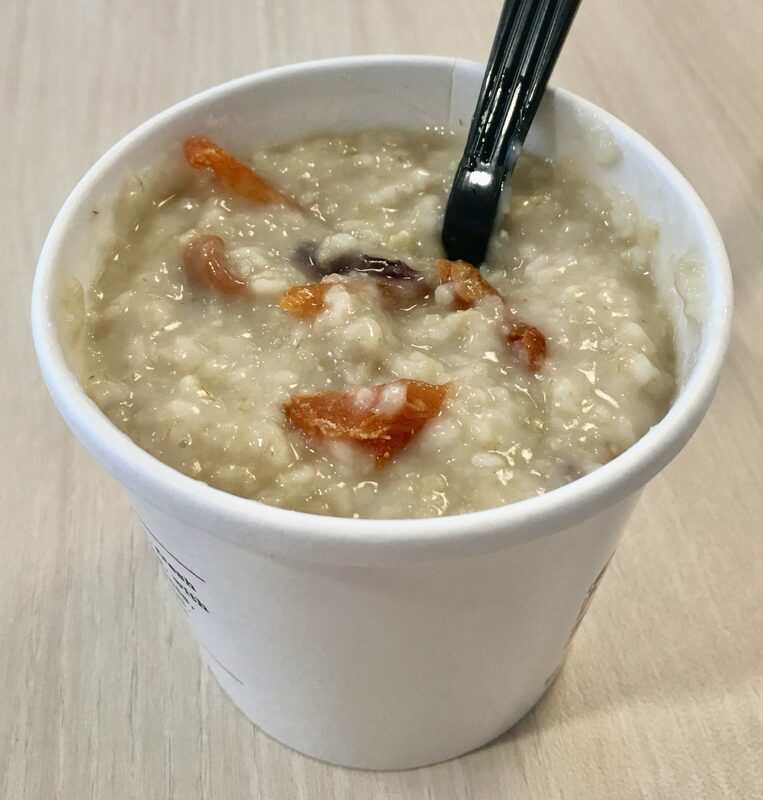 The hot cereal plumps the dried fruit, adding a chewy sweetness, and making a healthy breakfast even more delicious! 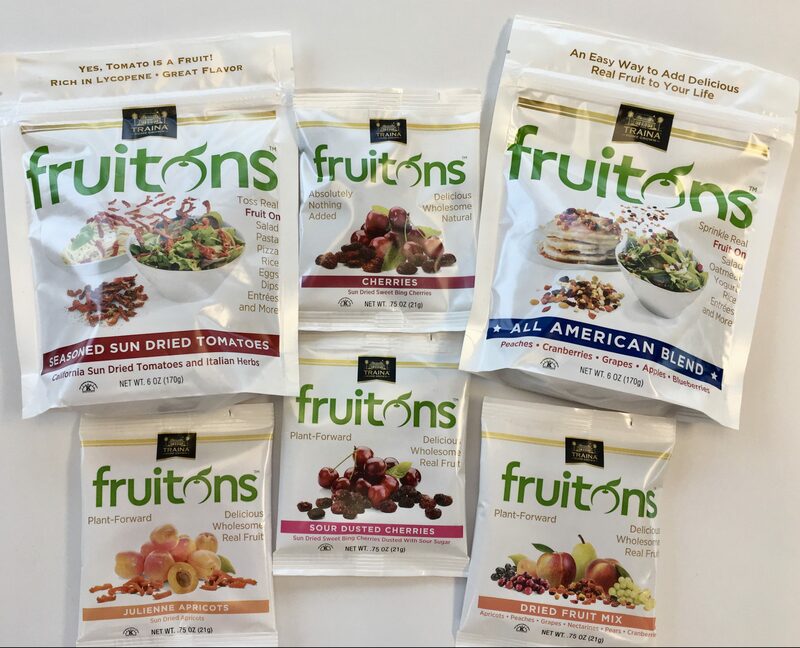 Fruitons also come in larger, resealable 6-once bags, so you can add the taste and nutritional benefits of dried fruit to all of your summer recipes. 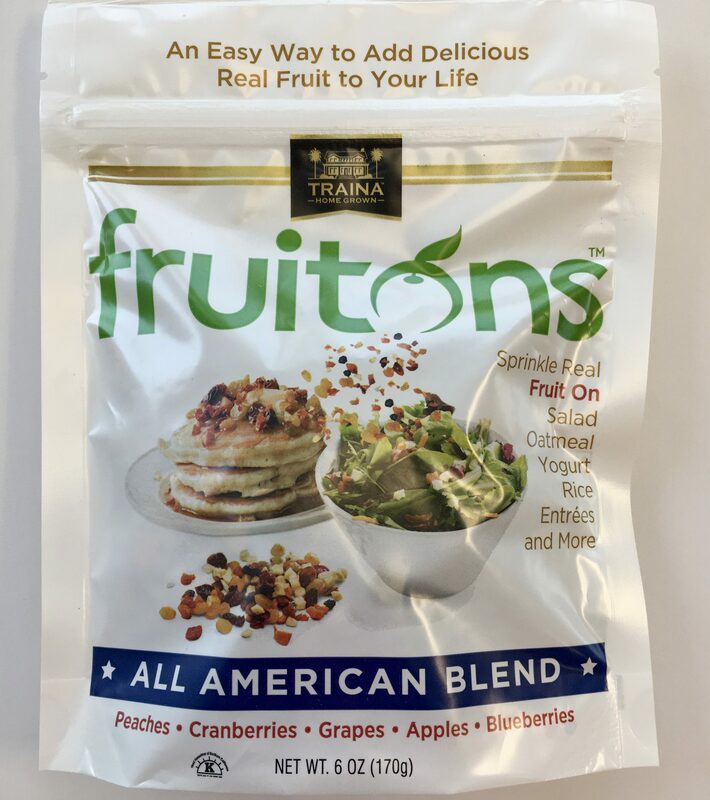 Fruitons All American Blend contains a pleasing assortment of dried peaches, cranberries, grapes, apples and blueberries. This selection is ideal for making your own trail mix, sprinkling into salads, mixing into yogurt, and for perking-up the aforementioned hot cereals. 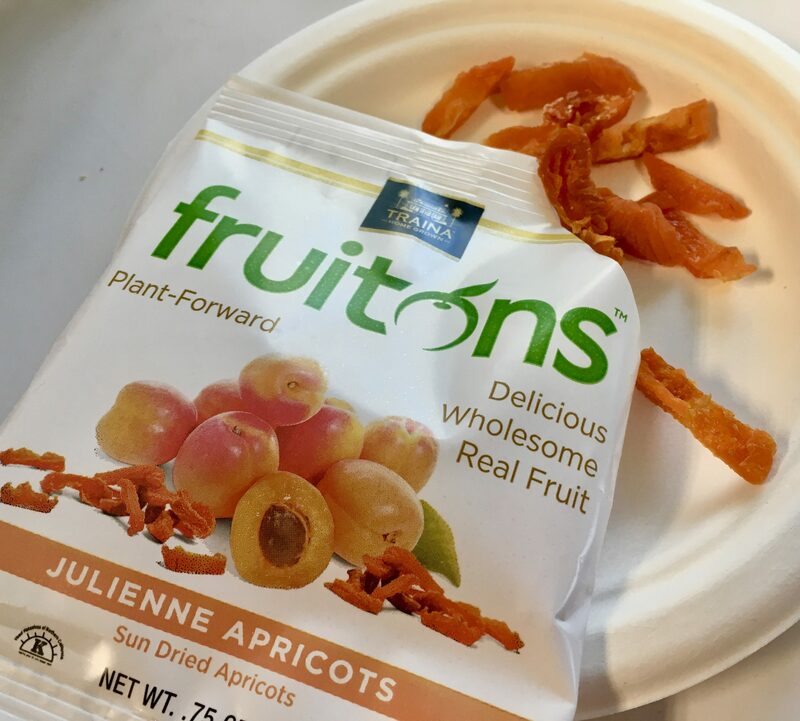 Fruitons would also be an excellent substitute for raisins or other dried fruits that are called for in a variety of baking recipes! The creative possibilities are endless. Do you like sun-dried tomatoes? Who doesn’t? You probably already have a few favorite pasta recipes that call for this premium ingredient. 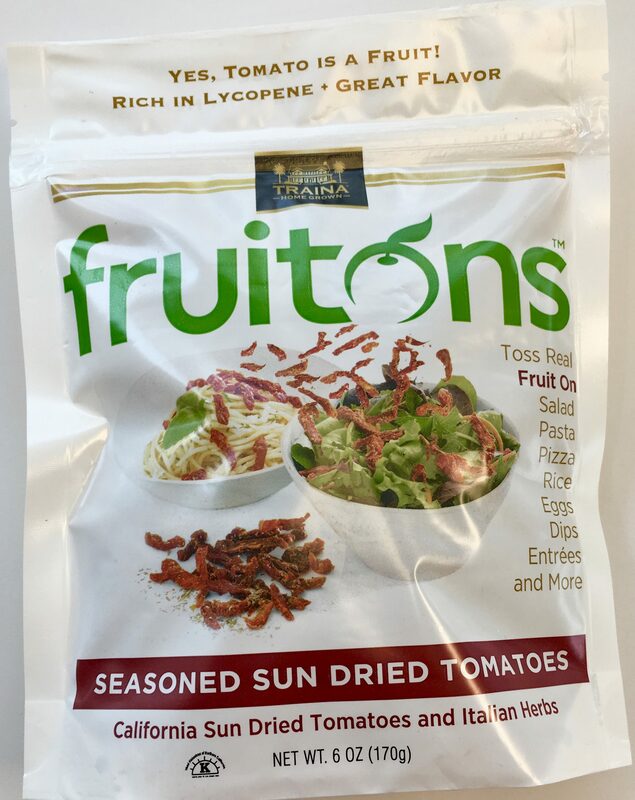 Now you can have sweet and savory sun-dried tomatoes on hand all the time! If you’re planning a BBQ any time soon, be sure to pick up a couple of bottles of Traina Home Grown’s new Gourmet Ketchups and BBQ Sauces for all of your grilling needs! These sauces taste great on a variety of meats — burgers, chicken, steaks — as well as on vegetables, and used in dips. 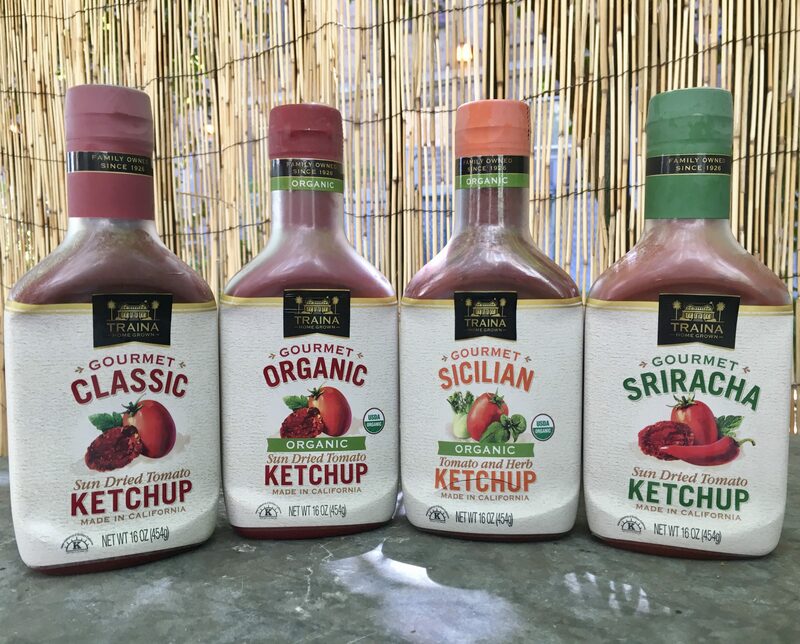 There are four pounds of tomatoes in every bottle of Home Grown Sun Dried Tomato Ketchup, and these ketchups are also gluten free, kosher, vegan and contain no corn syrup. There is an organic variety of Ketchup as well as two additional specialty favors. Gourmet Sicilian Ketchup, with its Italian herb blend, is great on fish and chicken, and to add a kick to your meal, try the spicy Gourmet Sriracha Ketchup! All are made with same care and quality ingredients. 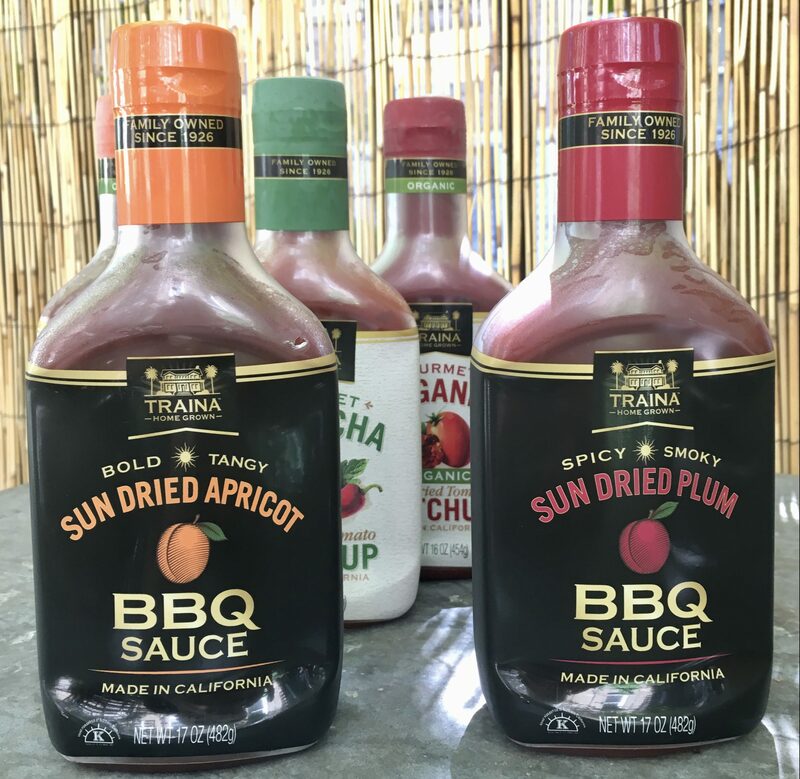 You’re probably not going to find BBQ sauces like these anywhere else, because Traina Home Grown BBQ Sauces are made with real dried fruit, for an extra special taste! 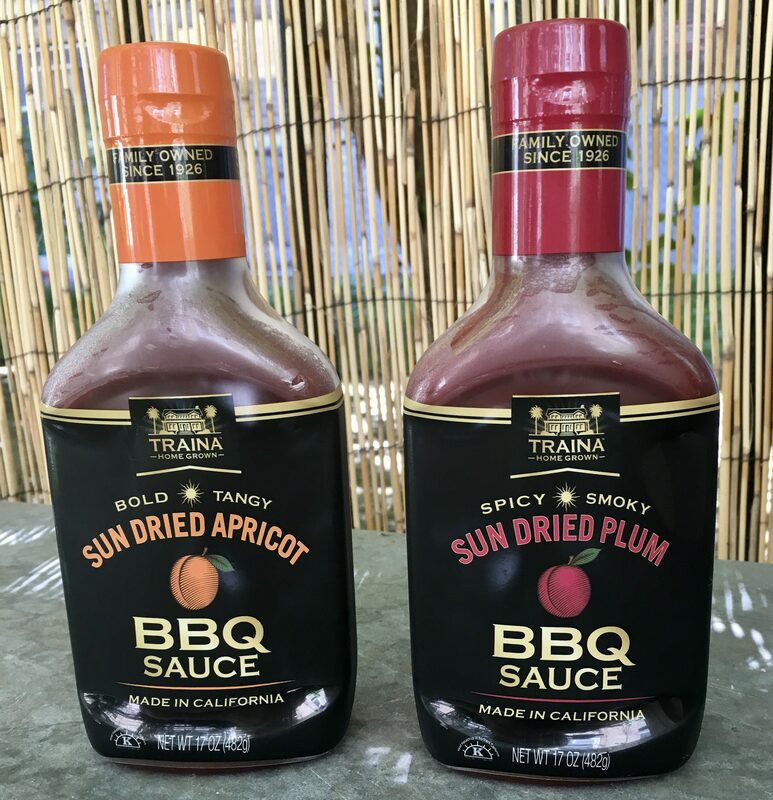 Both the Sun Dried Apricot and Sun Dried Plum BBQ Sauces are sweet and spicy, and would taste so amazing on ribs! The Sun Dried Plum variety reminds me very much of Hoisin Sauce. I served it as a dipping condiment with Trader Joe’s Masala Burgers, and it was off the hook! Find out more about the Traina family of fine products, shop online, get recipes or find out where to shop in your neighborhood for the products in this post, at This Link!